Double Story Time! We're trying a new structure for storytime during Pirate week! At 10:30am, little ones ages 3-7 can hear two swashbuckilng picture books, How I Became a Pirate by Melinda Long and Pirate Pete by Kim Kennedy. At 11:00am, we'll work on crafts that are great for kids aged 3-12. Finally, at 11:30am, we'll be reading excerpts from Treasure island by Robert Louis Stevenson! Activities will be designed with all ages in mind, so there will be something for everyone to do. PAJAMA TIME! STORY HOUR Pirates Friday, September 6 at 6:30p.m. ages 3yrs + Tonight Ms. Lisa wil share stories about Pirates. Make your own telescope, pirate hat and eye patch, search for treasure, and enjoy a snack fit for a pirate. Melinda Long signs The Twelve Days of Christmas in South Carolina. Join us for a fun hour of book discussion, crafting, and games! In conjunction with Main Street Theater’s Theater for Youth, Blue Willow Bookshop has created a great way to enhance and enjoy the theater going experience this season. For each play, we will host a book club style discussion of the author's works. You and your children will understand the book and enjoy the adaptation when you attend the play. This month’s play will be How I Became a Pirate. For more information about the Theater For Youth season in 2011-2012, click here. This is open to the public and is one hour in length. 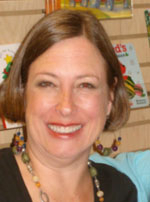 Melinda Long is currently considered a "single author." If one or more works are by a distinct, homonymous authors, go ahead and split the author. Melinda Long is composed of 2 names. You can examine and separate out names.